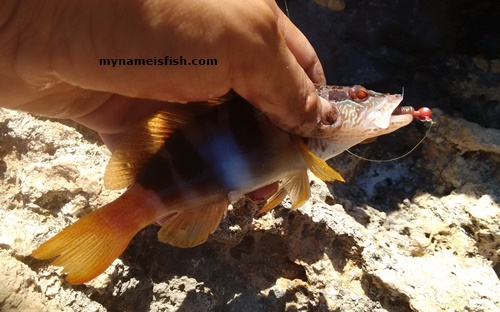 Painted Comber or Lettered Perch whatever you like to call it, I love this fish! Last year I visited some tackle shops in Talinn, capital of Estonia and I have bought a box of mixed colours and size rubbery soft plastic lures. Unfortunately because of terrible weather conditions I couldn't try them during my visit Baltic rivers and lakes in Estonia and Latvia, so I brought them with me to Turkey for winter LRF adventures. On a sunny Thursday afternoon I arrived at a quiet place where I could see the beautiful rocky bottom and I picked a dark brownish worm - about 3cm- from that box. When the sun is so bright and the water is so clear, I always use dark color soft lures on red or white jig heads; a learned lesson from my previous experiences. And this painted comber couldn't wait for too long; I felt that merciless attack on my hook as soon as the lure touched down the bottom. I love painted combers. Best game for fish species for LRF fans.